One thing I’ve come to like about food blogging, even before I started, is that it is interactive on so many levels. Readers commenting on your blog posts is one of them, and another is collaborating on recipes – whether it’s to create one or improve upon one already existing, I like doing it. It’s even more fun if you adapt a recipe blogged by another food blogger, post it on your blog, and that blogger comments on your version and also possibly offers any tips or suggestions to make it even better. That’s what puts blogging on a personal level that I don’t think can be achieved in the same way by cooking your way through a cookbook and feeling as if the author is right by your side, whether as a great teacher or a good friend. Most of that experience is based on your impressions of that author. In the end, you eventually recognize that it was you helping you all along and that author’s writing was an anchor, as Julie Powell came to understand with the help of her husband in Julie and Julia (the movie). I digress. The point of my bringing this up is that I made this soup again, but made a curry version of it after a suggestion made by Amy of Simply Sugar and Gluten Free in her comment on the first version. At the time I got her comment, I was about to make the soup again and thought that curry would be a great idea. So here we have it. As I learned with the first version, I learned the next day that the longer you cook this soup, the more it thickens. I had the unfortunate accident of cooking it too long: it was severely reduced to a mashed potato-like mush. It was still edible, but I didn’t find it so appealing when once it had been soup. So, the moral of this story is – don’t leave the soup, or reheating the next day, unattended. Blame the starch from the potatoes, if you must have something to blame. Sometimes, cooking is like small children: you have to keep a constant eye on it. 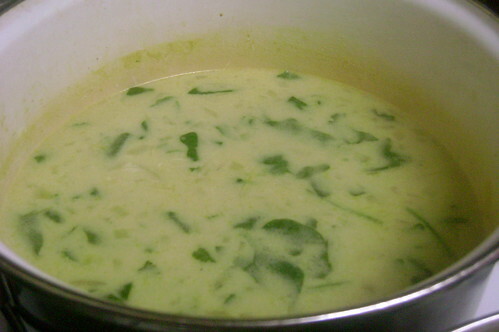 To make this soup, follow the instructions for the spinach Florentine potato soup (recipe here), but instead of rosemary, saute the onions with 1 teaspoon curry powder. Cooking the curry powder with the onions helps brown the spice (I could have this confused with another cooking term, but the gist of it is that I think it helps enhance the curry’s flavour or something?) You can use store-bought curry powder or make your own, as I did, using this recipe from Pecanbread.com. Also, this time I divided the 4 cups of potatoes. I added 2 cups to the soup, and I boiled the remaining 2 cups in a separate, smaller pot with water and mashed them instead of having to scoop out 2 cups-worth out of the pot. That step is optional, but I thought it made the soup a bit easier to make. I followed the rest of the instructions as usual. After it was done cooking, I adjusted the flavour, adding a scant amount more of curry powder. Before I end this post, how do you like the new look? I spent almost half a day working away at it yesterday and it’s still not done! Trust me, a few more improvements are on the way. Anyone who has done computer work, specifically things like programming and codes, knows it can take a long time and eventually you need a break from it to stay sane. It’s pretty mild (it’s only a teaspoon plus the scant (estimated 1/4 teaspoon) amount that I adjust the flavour with), although it could be made spicier. I think the curry helps balance out the creaminess of the coconut milk. Yum!! Must say that I’ve learned many a hard lesson when I don’t pay attention in the kitchen. I can be quite a perfectionist and anything that isn’t just right goes into the trash. Over time, I’ve gotten more moderate and found ways to use some of my mistakes. 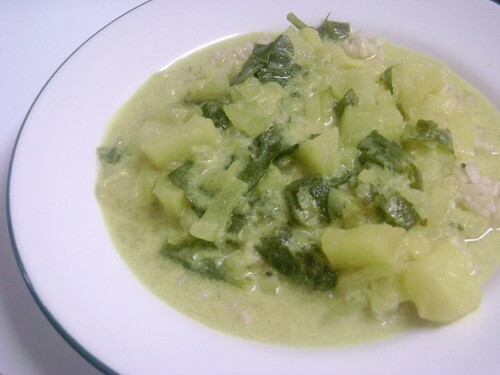 Thanks for this variation – I agree that the curry balances out the creamiess of the the coconut milk.